+3 admission 2019 Odisha will be begun after the declaration of CBSE and BSE Odisha. +2 pass Students can be submitted applications through the Students Academic Management System (SAMS) of Odisha online e-admission interface. All the details are available regarding Degree college admission in this post below. Odisha’s School and Mass Education (S&ME) Department is likely to declare the dates for +3admission 2019 Odisha into seats in various Degree (+3) Government and Private colleges for 2019-20 academic session in the Odisha State. The e-admission schedule for the all Degree (+3) Government and Private colleges, the online common application form (CAF) for +3admissions 2019 Odisha will be made available on Student Academic Management System (SAMS) website www.samsodisha.gov.in shortly. Key dates for +3 admission 2019 Odisha like online apply date and the last date of applying online CAF along with required documents and fee at nearest SAMS resource center will be will be available soon. To apply online fresh applicants should register themselves first on the SAMS website by using their active mobile number and e-mail address, and have to logins to apply for +3admissions 2019 Odisha online afresh. By the SAMS Odisha applicants will be intimated about their ranks in the merit list and reporting time through SAMS in their SAMS login. Applicants can get their Intimation Letter from SAMS Odisha official website after login. 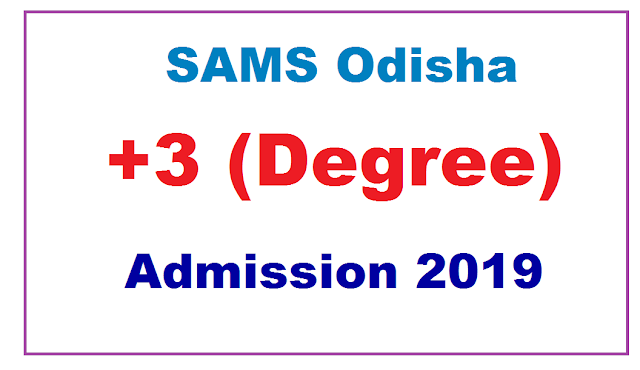 To take admission +3 Degree colleges in Odisha applicants have to register in the SAMS Odisha Portal herself/himself to avail different services under SAMS (e-Admission) such as online application, payments, selection, intimation, etc. The registration for the new applicants will be made through an OTP (One Time Password) process, as such a mobile number & email Id is very crucial. Multiple registrations at SAMS Odisha Portal are restricted against single mobile & email Id. The applicants must have need to pass the +2 examination from any recognized board or institutions can apply for Degree college admission 2019-20. We will intimate you the online application date with notifications in this post when it will be available for +3admissions 2019 Odisha. I think you like this post and if you want to know the more or the latest information about +3admission 2019 Odisha, please stay touch in this post.